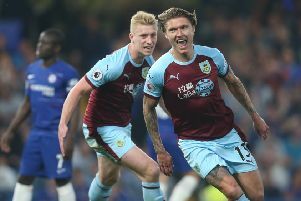 Hennings proud to be part of Clarets set up! Rouwen Hennings was the burgeoning golden boy of German football when his nation qualified for the 2009 UEFA European Under 21 championships. The 27-year-old was the tournament’s leading scorer with seven goals alongside controversial former Wales striker Ched Evans as Germany made the finals at the expense of France after a play-off. Hennings, then at St Pauli, featured for Horst Hrubesch’s side alongside future World Cup winners Mesut Ozil, Sami Khedira and Toni Kross, but missed the competition’s conclusion in Sweden through illness. Germany went on to win the tournament after beating England 4-0 in the final in Malmo. However, Turf Moor’s latest acquisition refuses to dwell on the ‘what ifs’ and is ready to affect his future with the Clarets. “My first station in professional football was Osnabruck in the second league,” he recalled. “It was there I started my Under 21 career. I played with really good players - Ozil, Khedira, Kroos, Neuer. “I got an illness before the European Championships though. It was in 2009 and my team won. I don’t know what would’ve happened if I wasn’t injured. That’s something I can’t change and I don’t care about things that I can’t change. I had a fever. I couldn’t train for seven weeks so I missed pre-season for the Championships. Hennings, who still harbours dreams of rejoining his former international team-mates at senior level, added: “I hope so but there’s so many really good players. If Joachim Low wants me then he can give me a call. Hennings netted 17 league goals last term as Karlsruhe went within seconds of reaching the Bundesliga. After a 1-1 draw against his former club Hamburg at the Imtech Arena, where Hennings netted, Reinhold Yabo’s 78th minute strike at the Wildparkstadion put the hosts on the brink of promotion. But Marcelo Diaz equalised in stoppage time to take the game to extra-time where there was more drama. Nicolai Muller gave Hamburg the advantage in the 115th minute before Hennings missed from the spot late on. Hennings has tried to erase that memory of play-off final heartache, and he’ll be looking to do something similar after a largely underwhelming debut for Sean Dyche’s side. A 2-0 defeat against Ipswich Town at Portman Road, where he replaced Jelle Vossen as a 55th minute substitute, was followed by a nightmare journey home with road closures leading to a 3 a.m. return. However, Hennings draws on the experience philosophically: “When I came on it was 0-0 and we lost the match. It’s easier for a player when he comes in and there’s chances. I think we only had one chance after my substitution. I think in the next games we can show that we can play in the offensive line. Now the striker, who lists Thierry Henry, Ruud van Nistelrooy, Didier Drogba, Ronaldinho, Ronaldo, Mario Basler, Jurgen Klinsmann and Karl-Heinz Reidle as his favourite players, is hoping to build on his first outing. “When I’m involved I learn things much quicker,” he said. “I hope I’ll learn something more every day and play in the games. “In Germany it’s more technical. The team stands in lines and we only attack if the other team comes in to our line. It’s a little bit different here because the forwards have to attack the defenders. It’s really intensive. It’s another type of football but I’ll learn it. He added: “It’s a nice time for me. I’ve seen that we have a good team and really good players. “It was a dream to come to England. I like the type of football. It’s good for me, it’s powerful.